Today, I bring you the February 2016 Dead Loot Crate unboxing. 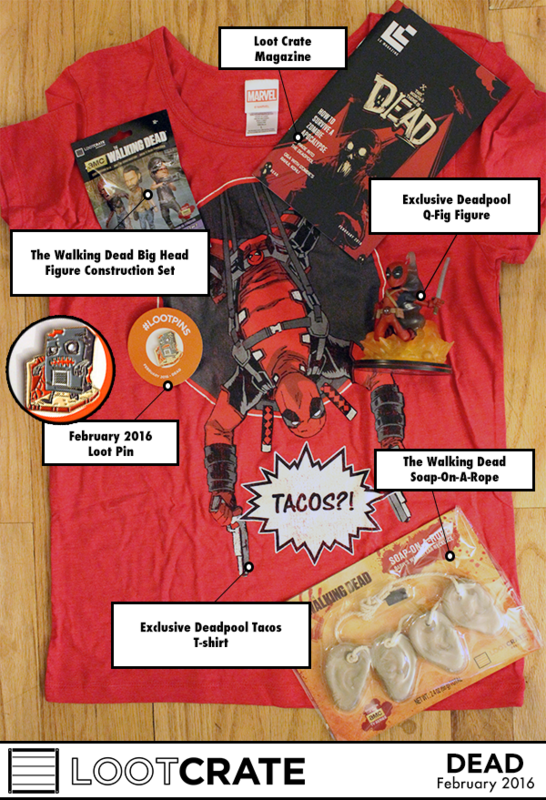 This crate featured exclusive items from AMC’s The Walking Dead and Marvel’s Deadpool. The monthly themed Loot Crate is at the core of all our unboxings. Loot Crate™ was founded in 2012 by an entrepreneurial team of geeks and gamers who thought that online retail was missing the sense of community, interactivity, and mystery we fell in love with at shows like PAX and Comic-Con. Each month, Loot Crate™ ships a themed mystery box of the best geek, gaming, and pop culture gear to a subscriber base of over 400,000 Looters. We emphasize phenomenal support and content, and include gear from some of the most respected entertainment and consumer product companies in the world. Check out the official Loot Crate website to see past collections as well as details on upcoming collections.